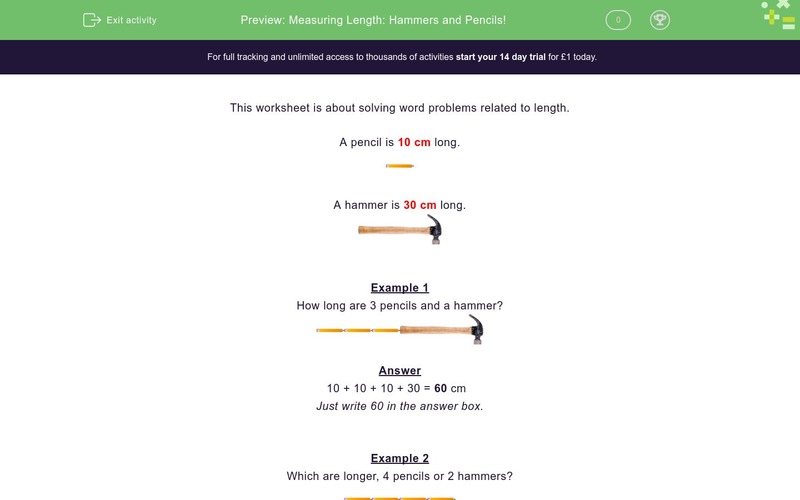 In this worksheet, students solve word problems related to length. This worksheet is about solving word problems related to length. A pencil is 10 cm long. A hammer is 30 cm long. How long are 3 pencils and a hammer? Just write 60 in the answer box. Which are longer, 4 pencils or 2 hammers? How long would two pencils be in cm? How much longer is the hammer in cm? How long would two hammers be in cm? How long would a pencil and a hammer be in cm? How long would a pencil and two hammers be in cm? How long would a pencil and three hammers be in cm? How long would two pencils and a hammer be in cm? How long would two pencils and three hammers be in cm? How long would three pencils and three hammers be in cm? Which are longer, 5 pencils or 2 hammers?